NVMe is no longer a nice-to-have storage technology. If you’re shopping for a new PC, it’s a feature you should actively seek out. Moreover, if your PC is of fairly recent vintage, you should upgrade to NVMe. Here's why. NVMe is a communications standard/protocol developed specially for SSDs by a consortium of vendors including Intel, Samsung, Sandisk, Dell, and Seagate. It operates across the PCIe bus (hence the ‘Express’ in the name), which allows the drives to act more like the fast memory that they are, rather than the hard disks they imitate. Bottom line: NVMe is fast. Really fast. Like never-have-to-wait-again-for-your-computer fast. 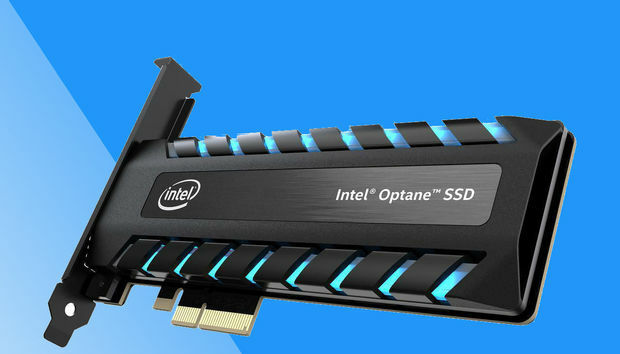 See our roundup of best SSDs for more details on these picks and others. Not to belittle the efforts of CPU and GPU vendors over the last decade, but the reason the latest top-end PCs seem so much faster is because of the quantum leap in storage performance provided by SSDs. Storage was the last bottleneck for real and perceived performance, but it’s now wide-pour with a vengeance. If you’ve bought, say a MacBook Pro, in the last two years, you may have noticed that you hardly wait at all anymore for mundane operations. Programs pop open, files load and save in an instant, and the machine boots and shuts down in just a few seconds. That’s because the NVMe SSD inside the latest MacBook Pro reads and writes data literally four times faster than the SATA SSDs found in previous generations. Not only that, but it locates them 10 times as fast (seek). 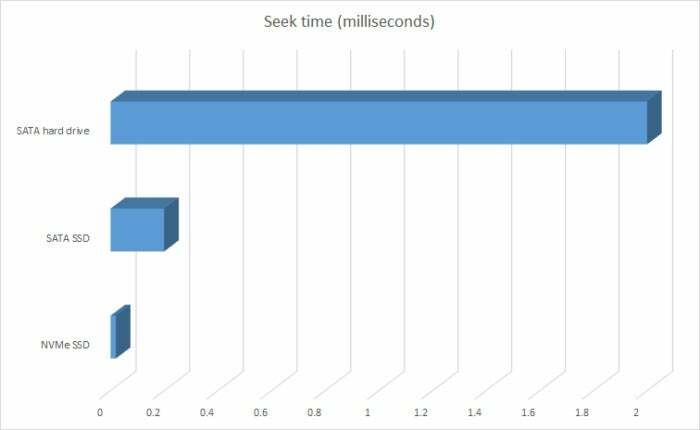 That’s on top of the four- to five-fold improvement in throughput and ten-fold improvement in seek times already provided by SATA SSDs (over hard drives). 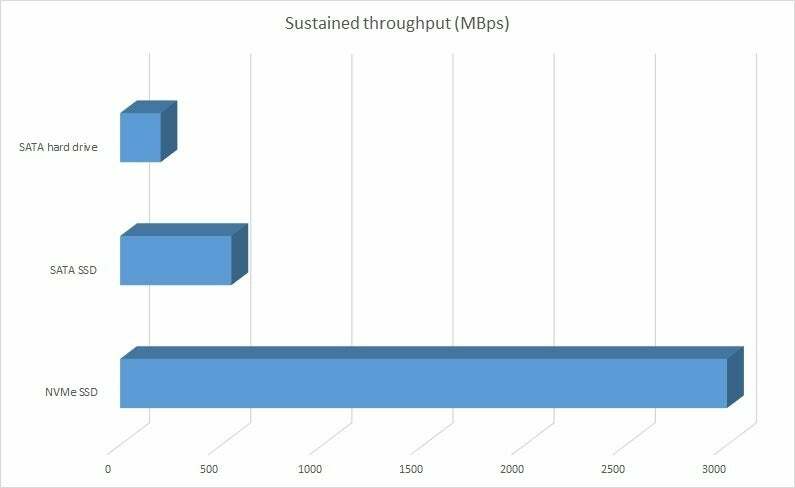 Not that you need sustained throughput like this very often, but NVMe makes short work of transferring files of any size. HDD = 200MBps, SATA SSD = 550MBps, NVMe SSD = 3GBps. Longer bars are better. The CPU and GPU development curve pales in comparison to that of storage over the last 10 years. HD = 2-5 ms seek, SATA SSD = 0.2 ms seek, NVMe SSD = 0.02 ms seek. Shorter bars are better, but this is an overall average. Some drives in each category might do better, some will do worse. Hard drives still offer tremendous bang for the buck in terms of capacity and are wonderful for less-used data. But for your operating system, programs, and oft-used data, you want an NVMe SSD if your system supports it, or a SATA SSD if it can’t. There’s a reason why we still have SATA SSDs and NVMe SSDs. Knowing the potential of memory-based SSDs, it was clear that a new bus and protocol would eventually be needed. But the first SSDs were relatively slow, so it proved far more convenient to use the existing SATA storage infrastructure. Though the SATA bus has evolved to 16Gbps as of version 3.3, nearly all commercial implementations remain 6Gbps (roughly 550MBps after overhead). Even version 3.3 is far slower slower than what today’s SSD technology is capable of, especially in RAID configurations. The Sandisk Extreme Pro offers the exact same performance as the WD Black NVMe. Because, wait for it—it’s the same drive. The drive uses four PCIe lanes for a theoretical maximum throughput of well over 3GBps. For the next step, it was decided to leverage a much higher-bandwidth bus technology that was also already in place—PCI Express, or PCIe. PCIe is the underlying data transport layer for graphics and other add-in cards. As of gen 3.x, it offers multiple lanes (up to 16 in most PCs) that handle darn near 1GBps each (985MBps). PCIe is also the foundation for the Thunderbolt interface, which is starting to pay dividends with external graphics cards for gaming, as well as external NVMe storage, which is nearly as fast as internal NVMe. Intel’s refusal to let Thunderbolt die was a very good thing, as many users are starting to discover. Of course, PCIe storage predates NVMe by quite a few years. But previous solutions were hamstrung by older data transfer protocols such as SATA, SCSI, and AHCI, which were all developed when the hard drive was still the apex of storage technology. NVMe removes their constraints by offering low-latency commands, and multiple queues—up to 64K of them. The latter is particularly effective because data is written to SSDs in shotgun fashion, scattered about the chips and blocks, rather than contiguously in circles as on a hard drive. The NVMe standard has continued to evolve to the present version 1.31 with the addition of such features as the ability to use part of your computer’s system memory as a cache. 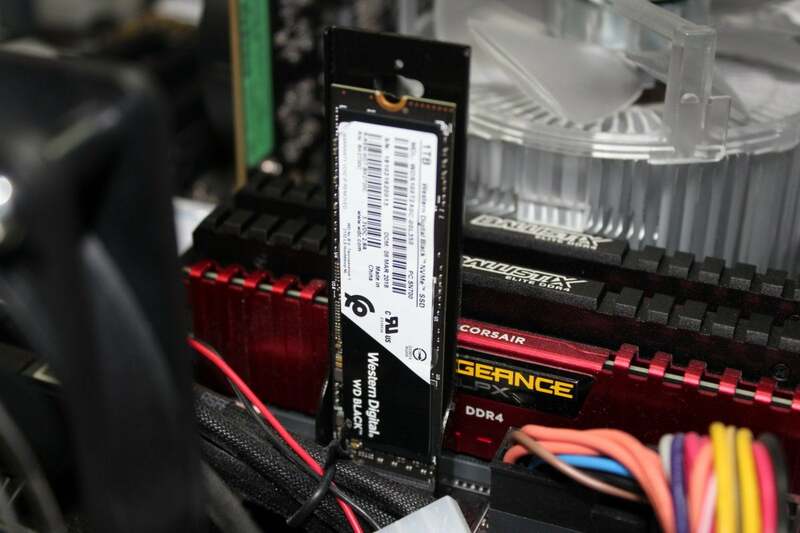 We’ve already seen it with the supercheap Toshiba RC100 we recently reviewed, which forgoes that onboard DRAM cache that most NVMe drives use, but still performs well enough to give your system that NVMe kick (for everyday chores). It’s possible to add an NVMe drive to any PC with an PCIe slot via a $25 adapter card. All recent versions of the major operating systems provide drivers, and regardless of the age of the system you will have a very fast drive on your hands. But there’s a catch. To benefit fully from an NVMe SSD, you must be able to boot the operating system from it. That requires BIOS support. Sigh. Most older mainstream BIOSes do not support booting from NVMe and most likely, never will. There’s simply no benefit to the vendors to add it, and a very real downside: You’re unlikely to upgrade a system that’s been updated with NVMe unless you play PC games or do something truly CPU-intensive, like editing 2160p video. 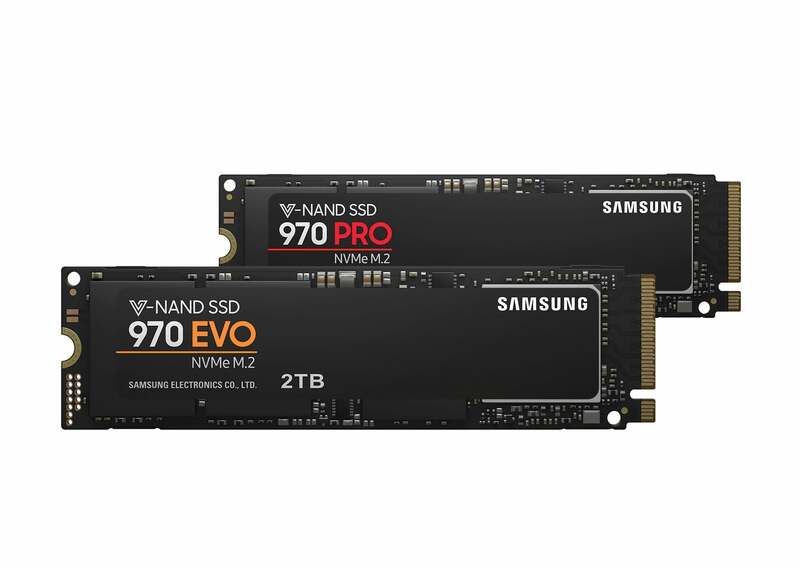 An M.2 NVMe SSD such as the relatively affordable and very fast (except for extremely large transfers) Samsung 970 EVO can live in a M.2/PCIe slot, or in a regular PCIe slot (x4 or greater) by means of a cheap adapter card. Most NVMe SSDs being sold in the consumer space use the M.2 form factor. But simply having an M.2 slot doesn’t guarantee NVMe compatibility. M.2 was designed to support USB 3.0, SATA, and PCIe. Most early M.2 slots supported only SATA. Read your system or motherboard user’s guide, or check online. Note that the MSATA slot, which is the precursor, looks very similar. There’s no way to tell from looking at a slot whether it supports PCIe and NVMe, but you can tell the difference between an PCIe x2 and PCIe x4 slot. The former, called B-keyed (a key is a rise that marries with a gap in the contacts on the drive), has six contacts separated from the rest, while the latter, M-keyed, has five contacts separated from the rest on the opposite side. There is no hard-and-fast rule, but many B-key slots were SATA only. If you have a B/M-keyed slot with both sets of contacts separated, the most common today, you’re golden. These are also sometimes referred to as socket 2 and socket 3. While our testbed’s M.2 slot supports PCIe and NVMe, yours may not. Shown here is WD’s Black NVMe SSD—a very worthy drive that sustains transfers better than its Samsung 970 EVO competitor. If your socket lets you down, it’s time for the $25 PCIe M.2 adapter card that I mentioned. Plextor’s M9Pe and others are available already mounted on PCIe cards as ready-to-rock products. What you as an end-user should avoid are 2.5-inch NVMe drives. These require the SFF-8639 (Small Form Factor) connector. An SFF-8639 connection features four Gen 3 PCIe lanes, two SATA ports, plus sideband channels and both 3.3-volt and 12-volt power, but it’s found only in enterprise-level storage adapters and systems. On the off-chance you’re using one of the rare Windows PCs that supports Thunderbolt (many with Asus motherboards do), you may be able to use an external Thunderbolt PCIe enclosure to add NVMe to your system. This works like a charm on a Thunderbolt Mac that’s new enough to run High Sierra. While just about any NVMe should make your system feel quicker, they are not all alike. Not even close. Where Samsung’s 970 Pro will read at over 3GBps and write at over 2.5GBps, Toshiba’s RC100 reads at 1.2GBps and writes at just under 900MBps. The difference can be even greater when the amount of data written exceeds the amount of cache on board. x4 PCIe NVMe SSDs are faster than x2 PCIe types. The more NAND chips, the more paths and destinations the controller has to distribute and store data at. Smaller capacity drives are quite often slower than the larger capacity drives, even given the same model number. The type of NAND used matters. SLC (Single-Level Cell/1-bit) is fastest, MLC (Multi-Level Cell/2-bit) is next, TLC (Triple-Level Cell/3-bit) is slower, and QLC (Quad-Level Cell/4-bit is slowest. However, the formula is complicated by the fact that you can treat any type of NAND (except SLC) as its faster predecessor by simply writing fewer bits. Vendors do this with portions of the SSD for use as cache, which means that a TLC or QLC drive can be just as fast as a SLC drive, until this cache is used up. Most controllers these days are very efficient, but some, such as those used by Intel and Sandisk, are smarter about how they use cache and can sustain write performance with larger data sets. Check out our SSD reviews at for the skinny on individual drives. If all that hasn’t driven home the point, let’s say it again: NVMe is the storage technology you want for your current or next PC. Unless you’re a gamer or high-resolution video editor, it virtually guarantees that you won’t feel the need replace your current system for quite a while—at least because of performance. Indeed, I’ve felt zero compulsion to replace my six- to seven year-old systems since they were upgraded with NVMe SSDs. Zero. This article originally posted April 3, 2015.